That’s the new finding from a report released last week by the National Bureau of Economic Research. 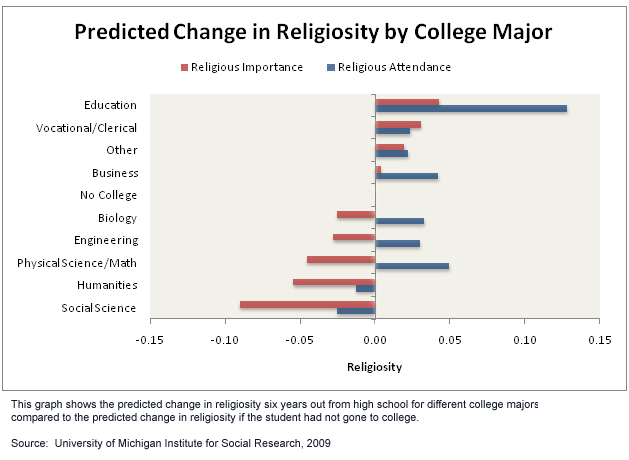 Social scientists at the University of Michigan used survey data from tens of thousands of U.S. students, each interviewed more than once, to see how their answers changed over time when they were asked two questions: “How important is religion in your life?” and “How often do you attend religious services?” Education majors blew others out of the water with their gains in religious attendance. Somewhat surprisingly, students in physical and biological sciences didn’t change much when it came to religion. The study researchers hypothesize, therefore, “that Postmodernism, rather than Science, is the bete noir — the strongest antagonist — of religiosity.” Postmodernism is now a cornerstone of contemporary humanities and social science. But postmodernists believe that knowledge is relative rather than absolute, and that belief makes it harder to hang on to concepts of absolute truth or morals.